While searching the skies for black holes using the Spitzer Space Telescope Deep Wide Field Survey, Ohio State University astronomers discovered a giant supernova that was smothered in its own dust. In this artist's rendering, an outer shell of gas and dust — which erupted from the star hundreds of years ago — obscures the supernova within. This event in a distant galaxy hints at one possible future for the brightest star system in our own Milky Way. A giant star in a faraway galaxy hasended its life with adust-shrouded whimper instead of the more typical bang, scientists say. Astronomers have never-beforeobserved such an event, butthink they were likely more commonin the universe'syouth. And a similar dust squelching may await the brightest starsystem in ourgalaxy if it explodes, scientists said. A supernova is the explosive end to ahuge star around eightor more times the mass of our sun. One occurs when a massive star hasexhaustedits supply of fuel and can no longer sustain itself. Stars greater than20times the mass of the sun can collapse in on themselves to formstellar black holes. It was black holes, of a more massivevariety, thatresearchers were searching for when they discovered the fizzledsupernova whileporing over data from NASA's Spitzer Space Telescope. The astronomers were searching for supermassiveblack holes at the centers of galaxies by identifying cosmichot spots ?the heat signature radiated by the disks of material around such blackholegiants. One very hot spot, which appeared inAugust 2007, didn'tmatch the signature of a black hole. It also burned hot, and then fadedawayquickly, disappearing entirely in March 2008. "Over six months, it released moreenergy than our suncould produce in its entire lifetime," explained study team memberSzymonKozlowski, now of Warsaw University Observatory in Poland. The fast flare-out, which occurred ina galaxy about 3billion light-years from Earth, suggested the team had found a supernova.But these massive explosions typically release most of their energy aslight,not heat. The temperature of the mystery objectwas around 1,292degrees Fahrenheit (700 degrees Celsius). The research team wonderedwhat couldabsorb huge amounts of light energy and dissipate it as heat. Their answer: dust, and a lot of it. 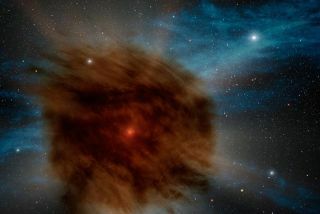 The scientists, led by astronomerresearcher ChristopherKochanek of Ohio State University, worked backward to determine whatkind ofstar could have spawned the supernova, and how the dust was able tomuffle theexplosion. They found that the star was mostlikely a giant, at least50 times more massive than our sun. Such massive stars typically belchcloudsof material as they near the end of their existence. At least two such ejection eventswere required to createthe dust required for the events Kochanek and his team spotted. Thefirstoccurred about 300 years before the supernova exploded, and the othercame justfour years before the explosion. The dust and gas from both ejectionsthen remainedaround the star in the form of two slowly expanding shells. The younger inner shell ? createdfrom the second dustejection event ? would be very close to the star, while the outer shellwouldbe much farther away. "We think the outer shell must benearly opaque, so itabsorbed any light energy that made it through the inner shell andconverted itto heat," Kochanek said. Stars probably choked on their owndust much more often inthe distant past, according to the researchers. "These events are much more likely tohappen in asmall, low metallicity galaxy," said study team member KrzysztofStanek,also of Ohio State. "Low metallicity" refers to a young galaxy thathasn?t been around long enough for its stars to fuse hydrogen andhelium intoheavier, more complex elements astronomers call metals. The research is detailed in a recentonline issue of theAstrophysical Journal. Astronomers will likely find moresuch supernovae in thenear future, the researchers said, especially with the help ofinstruments suchas the Wide-Field Infrared Survey Explorer, an infrared space telescopelaunchedby NASA in December 2009. "I would expect WISE to see 100 ofthese events in twoyears, now that we know what to look for," Kozlowski said. Because of the unfavorable alignmentof the star's host galaxywith Earth and our sun, astronomers were not able to see what thedust-shroudedsupernova event looked like to the naked eye as it was happening. But the researchers said the star mayappear to brighten adecade or so from now, when the shockwave from its explosion reachesthe innerdust shell and sends it crashing into the outer shell. A similar light show could also occurcloser to home,according to the scientists. EtaCarinae, the brightest star system in our Milky Way, wouldprobably bedust-smothered if it exploded, they said. ?If Eta Carinae went supernova rightnow, this is what itwould probably look like,? Kochanek said. The two stars known to make up EtaCarinae are 7,500 light-yearsaway, and they host a distinctive dust shell called the HomunculusNebula, among other layers of dust. Astronomers believe thatthe nebula wascreated when the larger of the two stars underwent a massive eruptionaround 1840,and that future eruptions are likely.